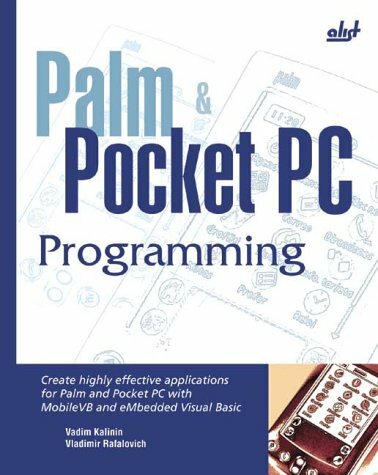 Palm & Pocket PC Programming by Kalinin, Vadim; Rafalovich, Vladimir: A-List Publishing 9781931769204 PAPERBACK - Nye Discount Books, Inc.
"A guide to developing applications for the main types of modern mobile devicesùthe Palm OS and the Pocket PC, this book focuses on using the new MobileVB tool from AppForge to create PDA applications. The applications developed are specifically for Palm devices, pocket computers with the Pocket PC/Windows CE operating system, and for Kyocera and similar communicators. Descriptions are of a different, free development environment from MicrosoftùeMbedded Visual Basic 3.0ùthat allows programmers to create applications for pocket computers with the Pocket PC OS and its previous version, Windows CE. Tasks that use databases including a compact version of the SQL server are emphasized. Described are the basic features of MobileVB and eVB and their limitations when compared to standard Visual Basic. A detailed description is given of the controls (ingots) of each of the languages, the library functions, and the accompanying utilities. Also covered are a wide range of possible programs including games, applications that use databases, and Internet technologies." Vadim Kalinin is a software developer for Pocket PCs that run in Windows CE and has worked on a number of projects concerning the development and implementation of software for managing businesses. Vladimir Rafalovich is a software analyst and developer. He lives in Tampa, Florida. We have 5,000 Sq.ft. of new and used books all in great condition. Bookseller: Nye Discount Books, Inc.